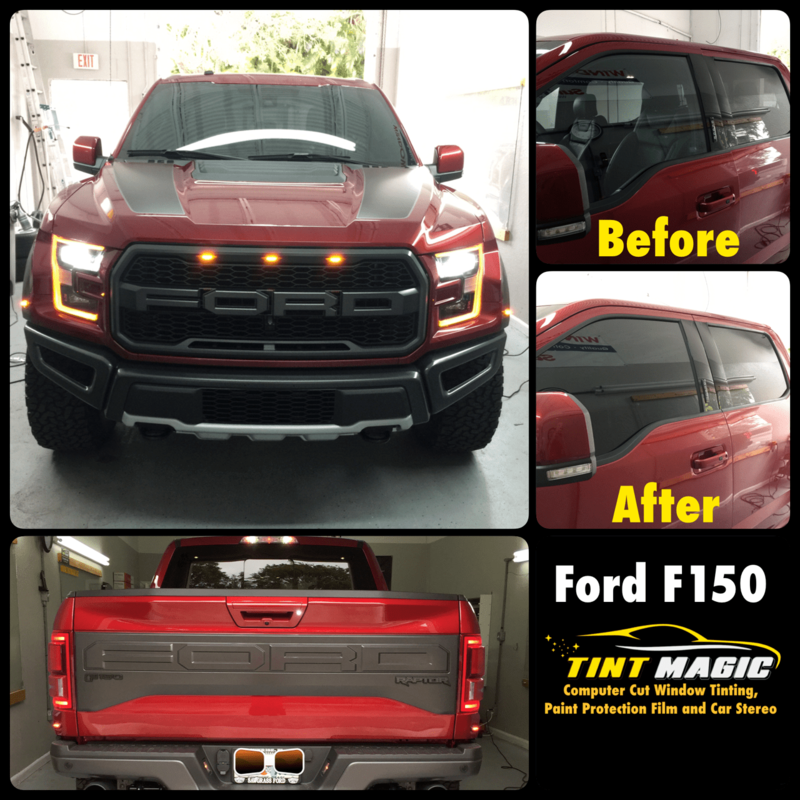 Ford F 150 at Tint Magic Window Tint Coral Springs. We have applied SunTek Carbon Gold Package 25% in front windows ( driver and passenger) and 55% over rear windows with existing factory tint. We are located at 11344 Wiles Road coral Springs, Fl 33076. Call us for the best quality and service! (954)840-7883. The legendary F-150—with an aluminum bed and body—earns a 2017 10Best award. The base 3.5-liter V-6 (253 lb-ft), optional 2.7-liter turbo V-6 (375 lb-ft), and optional 5.0-liter V-8 (387 lb-ft) all pair with six-speed automatics. The optional 3.5-liter twin-turbo V-6 (470 lb-ft) and its standard 10-speed automatic are best for towing, with a maximum capacity of 12,200 pounds. Regular cab, SuperCab, and SuperCrew bodies as well as 5.5-, 6.5-, or 8-foot beds make the F-150 an adaptable classic. One result is that the newest F-150 isn’t just a10 Best Trucks and SUV’s winner, it’s good compared with any vehicle. Granted, towering above other traffic in the Caribou-accented leather interior of our King Ranch edition test model leaves no question as to whether you’re in a pickup, but this truck’s ride (on 55-series, 20-inch tires) is nothing short of astonishing. Both the Ford and the Ram 1500 deliver amazing ride quality, but the F-150’s tuning is even more impressive given our test truck’s higher payload capacity (1526 pounds versus 1262 for a recent Ram 1500 we tested). The greater the difference between a truck’s empty and fully loaded weight, the firmer and more jarring the unloaded ride usually is. But that isn’t the case with the F-150—attentive damper and spring tuning is evident and appreciated with every pothole, expansion joint, and speed bump traversed. In the vast majority of driving scenarios, the gearbox shifts through cogs so smoothly you won’t notice unless you happen to be staring at the gear indicator flanking the speedometer. The only time we felt some wonky shifting was during deliberate stabs at the throttle, when the transmission acted as if it were caught out between gears, a situation we intentionally provoked to see how the new transmission would interpret our commands.